What a day it has been here at the NAMA convention. I’ll have lots of posts over the next couple days so don’t go away. One of the things I’ve been able to do some more of today is interviews like this one here with Tom Slunecka, Executive Director of EPIC. 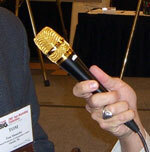 I’ve received a lot of attention today since I’m using the Golden ZimmComm Microphone. I brought it in honor of the 50 year anniversary of the National Agri-Marketing Association. 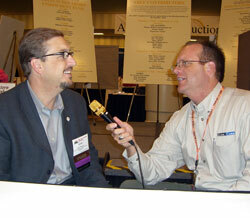 Visit the 2007 NAMA Convention Photo Album.